DALLAS — That sound emanating from 2500 Victory Avenue on Saturday night wasn’t just the final horn, ending a brutal night for the Dallas Stars at the hands of their former division rival, the Detroit Red Wings. But the accompanying sound was the loud thud as the Stars suffered a second straight loss to an Eastern Conference foe to end their five-game homestand at 2-2-1. On a night where the Red Wings were minus key offensive cog Pavel Datsyuk, who was scratched with a lower-body injury, and a game where Dallas outshot them 45-27, the visitors figured to have little chance of prevailing over the denizens of Big D.
However, a funny thing happened on Saturday night on the edge of downtown. Despite seeing the Stars log the game’s first 12 shots, it was Detroit who scored first when captain Henrik Zetterberg intercepted an attempted clearance from Stars center Tyler Seguin and flipped it into the back of the net to give the visitors an early 1-0 lead. To their credit, the Stars responded, tying it on a shorthanded goal that was later credited to Shawn Horcoff, who deflected in a wrister by Rich Peverley from the left faceoff circle, but that would be it for Dallas as far as offense. But Detroit lay in wait looking to capitalize on Stars mistakes, which there were plenty of and thanks to a pair of goals in a 14-second span later in the opening period, the Wings led 3-1 after one period, chasing Stars backup goaltender Dan Ellis from the nets. Starter Kari Lehtonen didn’t fare much better, allowing two more goals as the Stars were soundly beaten in their own barn by a Detroit team whose head coach Mike Babcock said after morning skate was having a hard time scoring goals. However, those goal-scoring woes weren’t an issue on Saturday night. And it was a game where both Peverley and Seguin were at less than full strength after missing practice on Friday with flu-like symptoms. Horcoff and Ray Whitney were also skating in their first game since they both missed the loss to Montreal on Thursday. "For the number of guys we had that weren’t feeling well, I thought our energy was good," Stars first-year head coach Lindy Ruff said. "Our execution in finishing opportunities wasn’t good enough. We didn’t defend very well. We would play well, be down in their end and then give up the puck and they’d go down and score." But if there was one area where the Stars definitely don’t need any more injuries it’s at the blue line, where Aaron Rome was lost for the final two periods on Saturday, putting Dallas down to just five healthy d-men. "It’s an upper-body injury," Ruff said of Rome’s condition. "He’ll probably be out this week." However, as the Stars now embark on a three-game East Coast road trip that will take them to face the New York Islanders, New Jersey Devils and New York Rangers, they will get one key veteran back on defense as Sergei Gonchar, who has missed six straight games with concussion-like symptoms, should return on Monday against the Islanders. Gonchar’s return and Rome being out for the entire road trip means that rookie Cameron Gaunce who was recalled from the Texas Stars of the American Hockey League in mid-December, gets to stay in the NHL a bit longer. But for a homestand that featured a solid win over the Kings and another good victory over the Predators along with a tough OT loss to the Blues, seeing it end with two straight losses to Eastern teams is a bit disheartening to Dallas captain Jamie Benn. "We obviously want a winning record (at home)," Benn said after the loss to Detroit. "We don’t want teams coming in here and stealing points." Of course, the Stars have played well on the road this season, so maybe leaving Big D for a week isn’t such a bad thing. "It’s time for us to regroup. 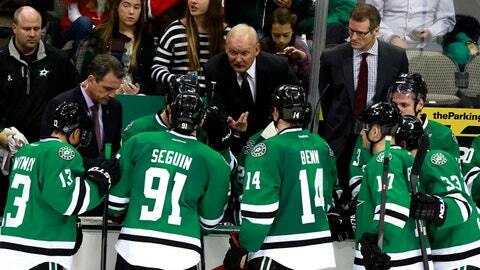 We can get away from home for some team bonding," Benn said.